Most recent American Idol champion, Scotty McCreery is turning 18-years old in about a week and what better way to kick off the symbolic passing into adulthood than to release your debut album? 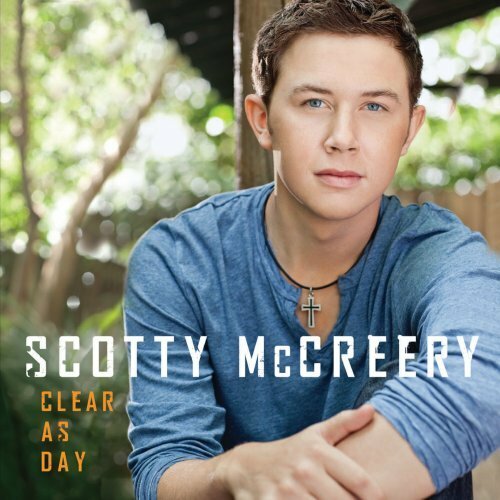 Clear As Day is the first of what is sure to be many solo albums for young Scotty and for a jumping off point, Clear As Day is a solid introduction into the country music world. We’ve gotten glimpses of what the album was going to be like in the form of leaked demos, and two singles – “I Love You This Big” and “The Trouble With Girls”—as well as a video, all of which performed very well on iTunes, CMT and country charts. As happy as Scotty’s fans were with what’s been released already; it turns out the best was yet to come. Clear As Day kicks off with “Out Of Summertime” about a summer fling in between school sessions, Scotty laments that “she could have been mine, but we ran out of summertime.” And “of all the things I let get away, she’s the one that keeps me awake at night.” I don’t know about you, but I fell in love about five times a year from the ages of 15-20 and remember this feeling all too well; Ahh the sweet vestiges of youth. Next in line is “I love You This Big” which I of course knew would be included in the album, I just don’t know if it works as far as flow from “Summertime” then into “Clear As Day.” The title track is a bit dramatic and has a tragic ending involving a car wreck; in other words, country fans will eat this song of lost youth, and love left unexplored right up. “The last thing you said, was I‘ll call you tomorrow/That’s a call you never got to make” are lyrics that will haunt me for a little while, especially with a son not too far from driving age himself. “The Trouble With Girls” is next and a nice, light-hearted welcome after the previous tearjerker. I already reviewed this latest single and still like it just as well; it’s not deep but celebrates the physical and emotional attributes of females of all ages as well as a teenage boy can. The most “rocking” tune so far is “Water Tower Town” and it reminds me of every single thing I loved about growing up down South with lyrics like “On Friday night football is king/sweet tea goes good with anything.” He even works in “your mom’n them,” which is a bit of a talent. “Nobody eats ‘til you say amen” is dead on and this song is fun to listen to and sing along with. The Keith Urban-penned “Walk In The Country” is a nice tune but sounds like, well, a Keith Urban song. I can imagine it will get a fair amount of radio play as a single but it doesn't flow with the rest of the album very well. “Better Than That” is another ode to love and youth and it’s the best Scotty has sounded the entire album. He sounds like a seasoned veteran and I love it. “Write My Number On Your Hand” is a fun, funny, honky tonk-ish tune and it’s exactly what the title implies: a quick encounter with a hot girl he’d very much like to see again. We’re only a couple songs away from the ending (boy that went quickly!) and the first true tear-jerker is upon us in the form of “Dirty Dishes,” which is a song about motherhood and childhood, the ups and downs that go along with both, and the fine line between enjoying each and every moment and still instilling values in these babies while making sure they enjoy their life and know how loved they are. Anyone familiar with the poem about cobwebs and babies will know exactly what this song is about. “Dirty Dishes” is hands down best song on the album reminding me very much of “Let Them Be Little” by Billy Dean. “Back On The Ground” is another one that kicks me in the gut as Scotty’s singing to his momma about growing up, moving away, and longing for the simplicity of childhood. “That Old King James” closes out the record and reminds us that no matter what, Scotty is a God-fearing, good Christian boy who loves his God, his family, friends, and his life. It’s a story starting with a little boy getting saved at 8-years old and the journey The Bible has gone on moving from one family member to the next, through the generations. Clear As Day isn’t the best album I’ve ever heard but is easily one of my new favorites. This is still a mostly feel-good effort even with a few emotional tearjerkers and for a debut from a promising young vocalist, it's a home run. Scotty has delivered more than I expected, and I had set the mark pretty high for this kid. Clear As Day is more than just a good country album; it’s a good storytelling album.